"On we swept," and passed many a shoal and reef, just perceptible by a change of colour upon the face of the water or a long treacherous ripple; to our right was the coast of Bahreyn [Bahrain], its sandy monotony broken here and there by some small and dingy village. Near nightfall we sighted the western corner of Katar [Qatar], called in many maps Bahran, but on what authority I hardly know; certainly no one here ever gives it that name. Now "Bahran" is simply the nominative of which "Bahreyn" is the genitive or objective case; and hence I suspect that our geographers may have been led astray by some grammatical misapprehension of a phrase. The coast of Katar before us looked rocky, but not high; it is very desolate-seeming; at intervals rise small watch-towers, much like those seen on different points of the Syrian shore, and ascribed by popular tradition to the Empress Helena, wife of [Constantius Chlorus, and mother of] Constantine the Great. During the night we were startled from slumber by the grinding of our keel upon a reef, an event followed by so much confusion, shouting, and awkward unseamanship, that our getting off was more the work of lucky chance than of the crew. Next day we had to endure foul wind and drizzling rain with nothing to shelter us, while we slowly worked our way up under Ras Rekan [Ra's Rakan, Ras Rakhan], the northernmost cape of the Katar promontory; a somewhat bold headland girt with cliffs thirty or forty feet high; we were long in getting round it. I noticed a good-sized fort on the heights; it belongs to a village situated in a gorge close by, but I have forgotten the name [Al Zubarah or Az Zubarah]. By the morning of the 28th [of January, 1863] we had fairly rounded Rekan, and drove southwards before the gale for Bedaa' [Al Bida, which was later engulfed by Doha]. The line of coast was all along steep, but of inconsiderable height; five or six villages, the abodes of fishermen, intervene between the cape and Bedaa', opposite which we arrived towards evening. Ebn-Khamees went on shore to pay his compliments to the chief and prepare a lodging; but the hour was late, and I preferred remaining on board the night. Next morning my companion returned to fetch me, and we waded together across a wide sandy reach till we entered Bedaa', the principal town of Katar at the present day. It is the miserable capital of a miserable province. To have an idea of Katar, my readers must figure to themselves miles on miles of low barren hills, bleak and sun-scorched, with hardly a single tree to vary their dry monotonous outline; below these a muddy beach extends for a quarter of a mile seawards in slimy quicksands, bordered by a rim of sludge and seaweed. If we look landwards beyond the hills, we see what by extreme courtesy may be called pasture land, dreary downs with twenty pebbles for every blade of grass; and over this melancholy ground scene, but few and far between, little clusters of wretched, most wretched, earth cottages and palmleaf huts, narrow, ugly, and low; these are the villages, or rather the "towns" (for so the inhabitants style them), of Katar. Yet poor and naked as is the land, it has evidently something still poorer and nakeder behind it, something in short even more devoid of resources than the coast itself, and the inhabitants of which seek here by violence what they cannot find at home. For the villages of Katar are each and all carefully walled in, while the downs beyond are lined with towers, and here and there a castle "huge and square" makes with its little windows and narrow portals a display of strength hardly less, so it might seem, superfluous than the Tower of London in the nineteenth century. But these castles are in reality by no means superfluous, for Katar has wealth in plenty, and there are robbers against whom that wealth must be guarded. Whence comes this wealth amid so much apparent poverty, and in what does it consist? What I have just described is, so to speak, nothing but the heaps of rubbish and the rubbishy miners' huts about the shaft's month; close by is the mine itself, a rich and never-failing store. This mine is no other than the sea, no less kindly a neighbour to the inhabitants of Katar than their dry land is a niggard host. In this bay are tbe best, the most copious pearl-fisheries of the Persian Gulf, and in addition an abundance almost beyond belief of whatever other gifts the sea can offer or bring. It is from the sea accordingly, not from the land, that the natives of Katar subsist, and it is also mainly on the sea that they dwell, passing amid its waters the one half of the year in search of pearls, the other half in fishery or trade. Hence their real homes are the countless boats which stud the placid pool, or stand drawn up in long black lines on the shore; while little care is taken to ornament their land houses, the abodes of their wives and children at most, and the unsightly strong-boxes of their gathered treasures. "We are all from the highest to the lowest slaves of one master, Pearl," said to me one evening Mohammed-ebn-Thanee [Muhammad bin Thani, 1800—1878], chief of Bedaa'; nor was the expression out of place. All thought, all conversation, all employment, turns on that one subject; everything else is mere by-game, and below even secondary consideration. I mentioned robbers and the danger of pillage. From each other, indeed, the men of Katar have, it seems, little to fear. Too busy to be warlike, they live in a passive harmony which almost dispenses with the ordinary machinery of government itself. Ebn-Thanee, the governor of Bedaa', is indeed generally acknowledged for head of the entire province, which is itself dependant on the Sultan of 'Oman; yet the Bedaa' resident has in matter of fact very little authority over the other villages, where everyone settles his affairs with his own local chief, and Ebn-Thanee is for those around only a sort of collector-in-chief, or general revenue-gatherer, whose occupation is to look after and to bring in the annual tribute on the pearl fishery [Qatar was controlled by Bahrain from the 1850s to 1868, and paid tribute to Bahrain until 1872]. Mohammed-el-Khaleefah [Muhammad ibn Khalifah Al Khalifa of Bahrain] has also a sort of control or presidential authority in Katar, but its only exercise in the hands of this worthy seems to be that of choosing now and then a pretty girl (for the female beauty of 'Oman extends itself, though in an inferior degree, to Katar), on whom to bestow the brief honours of matrimony for a fortnight or a month at furthest, with a retiring pension afterwards. While I was myself at Bedaa' the uxorious Khaleefah paid a visit to the neighbouring town of Dowhah, and there lightly espoused a fair sea-nymph of the place, to he no less lightly divorced long before my return from 'Oman. No solemnity was spared on the occasion; jurists were consulted, the dowry paid, public rejoicings were ordered, and public laughter came unbidden; while Mohammed wasted the hard-gained wealth of Menamah [Manamah, capital of Bahrain] and Moharrek [Al-Muharraq, 2nd largest city in Bahrain] in the pomp of open vice. Zabarah, the largest of the island towns, indeed the only one of any territorial importance, is the residence of one of the El Khaleefahs ; but it does not therefore claim any particular preeminence over the remaining localities of the province. But if the people of Katar have peace within, they are exposed on the land side to continual marauding inroads from their Bedouin neighbours, the Menaseer and Aal-Morrah [Al-Murrah]. The former of these tribes is numerous and warlike, and their favourite range of rapine or pasture extends from the frontiers of Hasa [Al-Hasa] to those of 'Oman proper near Sharjah. Few nomad clans give more annoyance to the inhabited districts, and few, if accounts be correct, have amassed a greater amount of ill-gotten opulence from plunder and bloodshed. These marauders possess large droves of camels and flocks of sheep, acquired and augmented at the expense of the villagers; and from the barren desert hard by, their retreat when pressed by danger, they bring their animals to pasture on the narrow strip of upland that lies between the coast-hills and the Dahnii. Hence the necessity for the towers of refuge which line the uplands: they are small circular buildings from twenty-five to thirty feet in height, each with a door about half-way up the side and a rope hanging out; by this compendious ladder the Katar shepherds, when scared by a sudden attack, clamber up for safety into the interior of the tower, and once there draw in the rope after them, thus securing their own lives and persons at any rate, whatever may become of their cattle. For to scale a wall fifteen feet high is an exploit beyond the ingenuity of the most skilful Bedouin. At times the Menaseer, emboldened by impunity (for the people of Katar have no great pretensions to warlike valour), attack the main villages, and carry off more valuable booty than kine [cattle] and sheep. Hence the origin of the strongholds or keeps within the towns themselves, and of the walls which surround them. Further down the coast towards the east begin the settlements of Benoo-Yass, an ill-famed clan, half Bedouins, half villagers, and all pirates; the very same whose cruisers have in former times given to this district the ominous name of "Pirate coast." The head point or main centre of Benoo-Yass is Soor; it is, so I was informed, a mere aggregation of huts, clustered under some old and ruined fortresses, dens of the robbers. The Benoo-Yass belong to the original inhabitants of 'Oman, and though devoid of its civilization, partake in its political and national feelings; hence they are not only haters of all Muslims and Wahhabees [Wahhabis], but even fierce enemies and aggressors whenever occasion permits. When plunder is the order of the day, they readily join hands with the Menaseer, though widely different from them in origin and in appearance. For the Menaseer, judging by tradition, physical outline, and dialect, are a branch of the great 'Abs family [Banu Abs], of whom was the famous 'Antarah-ebn-Sheddad [Antarah ibn Shaddad], and are, accordingly, by race Nejdeans from Keys-'Eylan, while Benoo-Yass trace their origin to the Kahtanee [Qahtanite] family of Modhej, and travelled hither northwards from Hadramaut, so runs their tale. Profit, however, like misery, may unite strange bedfellows. Both the Menaseer and Benoo-Yass have been much repressed of late by the activity of Ahmed-es-Sedeyree, the Nejdean resident at Bereymah [Dahiyah, Oman] (the same whose brother 'Abd-el-Mahsin-es-Sedeyree entertained us at Mejmaa'); while at sea the red 'Omanee pennon of the pirates has grown pale before the redder cross of St. George; and none but pearl-oysters and fishes have any violence to fear in this bight of the Persian Gulf at the present day. Of the third great clan hereabouts, namely, Afd-Morrah, the tenants of the Dahna [Ad-Dahna Desert] itself, and still more numerous and widespread, though luckily less pugnacious, than the Menaseer, I have already made mention. The Bedouins of this tribe, who visit Katar and 'Oman, now for trade and now for plunder, do not acknowledge Wahhabee sovereignty, but are, after their irregular fashion, some of them tributaries to the Sultan of Oman, while some remain at the bidding and buying of subordinate land-chiefs. The climate of Katar is remarkably dry; under the arid breath of the encroaching desert, the sea-air only a few miles inland seems to lose all trace of humidity. The soil is poor, gravel and marl mixed with sand; occasional springs of water supply wells laboriously pierced through the encrusted upper strata. The gardens are small and unproductive, nor did I see any cornfields or date-groves worthy of the name. The air too is said to be unhealthy; perhaps the rotting pools of stagnant sea-water that border all the coast, are the cause of this. 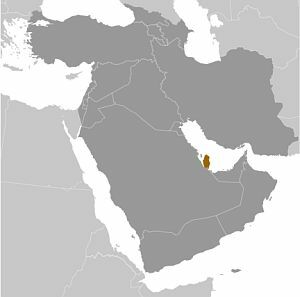 State of Qatar: Ruled by the Al Thani family since the mid-1800s, Qatar transformed itself from a poor British protectorate noted mainly for pearling into an independent state with significant oil and natural gas revenues. During the late 1980s and early 1990s, the Qatari economy was crippled by a continuous siphoning off of petroleum revenues by the Amir [Khalifa bin Hamad Al Thani], who had ruled the country since 1972. His son, the current Amir HAMAD bin Khalifa Al-Thani, overthrew him in a bloodless coup in 1995. In 2001, Qatar resolved its longstanding border disputes with both Bahrain and Saudi Arabia. As of 2007, oil and natural gas revenues had enabled Qatar to attain the second-highest per capita income in the world. Such is the general outline of Katar. On landing at Bedaa' we went right to the castle, a donjon-keep, with outhouses at its foot, offering more accommodation for goods than for men. Under a mat-spread and mat-hung shed within the court sat the chief, Mohammed-ebn-Thanee, a shrewd wary old man, slightly corpulent, and renowned for prudence and good-humoured easiness of demeanour, but close-fisted and a hard customer at a bargain; altogether, he had much more the air of a businesslike avaricious pearl-merchant (and such he really is), than of an Arab ruler. Bound him were placed many sallow-featured individuals, their skins soddened by frequent sea-diving, and their faces wrinkled into computations and accounts. However, Ebn-Thanee, though eminently a "practical " man, had thus far put his sedentary habits to intellectual profit, that by dint of study he had rendered himself a tolerable proficient in literary and poetical knowledge, and took great pleasure in discussing topics of this nature. Nay, he even pretended to have some medical skill, and did I think really possess about the same amount of it that many an old woman may boast of in a country village of Lancashire or Essex. Besides, he liked a joke, and could give and take one with a good grace. He enquired about my journey. I replied that I had no special business on hand for Katar, and that I was merely on my way to Mascat [Muscat, Oman] in search of herbs and drugs [Palgrave, a Jesuit priest who later renounced the church, was posing as a Syrian physician while gathering intelligence for the Jesuits and for the French Government of Napoleon III]. Ebn-Khamees, who was now an important character, thanks to the presents in his charge, sat close by the chief in all the grandeur of a new black mantle and a silken head-dress, furnished by Aboo-'Eysa. Mohammed-ebn-Thanee himself wore a Bengalee turban, of the date of Suraj-Dowlah [Siraj ud-Daulah, 1733-1757], to judge by its dingy appearance; his robe was an overdress which a Damascene grocer would have been ashamed to display out of doors. He apologized for want of room to lodge us suitably in the palace itself. I cast a look round its narrow precincts and loopholed stone walls, and fully accepted the excuse. Ebn-Thanee had by anticipation caused a warehouse close by to be emptied of the dates it held, and fitted up in Katar style for our reception; that is, mats were spread, and nothing more. We of course expressed due thanks for hospitality here regarded as munificent, drank coffee, talked awhile, and retired. Ebn-Khamees had soon shot his bolt, that is, offered his presents. But their receiver, the old pearl-monger, could not with equal speed make up his mind about the amount to be tendered in requital, and no less than eight days passed before a suitable retribution had been proposed and accepted. This delay, especially in bad lodgings and with much before us better worth seeing, was annoying enough, the more so that four days were fully sufficient for knowing all worth the knowing in so monotonous a country. However, the time did not go by wholly without profit, for it gave me leisure to make some excursions into the vicinity. The town of Bedaa' itself was soon explored. It owns a long narrow and dirty market-place, where some Bahreyn shopkeepers and artisans ply their business on a small scale; for the rest, Bedaa' consists of a mass of little narrow dingy houses, separated by irregular lanes. The total amount of its inhabitants when on land, which is not often the case, reaches about six thousand; a few colonists from Hasa come hither to try their fortune and grumble at the country. Everywhere one meets fishermen's wives, and their brats, more dirty and more clamorous than any in Crabbe's [George Crabbe 1754—1832] "Borough," and ill-dressed men, too careworn to be sociable. If we go down to the beach, we find there line on line of huge black boats, whose grooved edges show where the divers' cords have been let down, for a rope is always tied round the waist of the plunger, while the other end is held by his companions, and by this they draw him up when required. And now my reader may fairly appreciate Bedaa', and the attractions it presents to eyes, ears, and, like most seaport towns, to nostrils also. Still the people are not by nature ungracious or inhospitable, but they are over-engrossed by their occupations; and lastly, long-continued diving, accompanied by all the privations and hardships inseparable from weeks and months at sea in open boats, give to the males the appearance of men totally knocked-up. Till within quite recently Bedaa' owned neither mosque nor any other recognized place for public worship, and we must hope that every one satisfied his devotional obligations in private. But since the late Nejdean invasion, and the establishment of Ahmedes-Sedeyree at Bereymah, a "revival" in favour of Islam has taken place in some parts of Katar, and two mosques now adorn the town of Bedaa'. One of these edifices is large, but plain and unomamental, in the approved Wahhabee taste; it stands to the north of the castle. The other, situated at the opposite extremity of the village, is smaller, but much handsomer, with an open arched portico in semi-Persian style. Mohammed-ebn-Thanee, whether from political motives or from sincere conviction, I know not, perhaps from a mixture of both, is very devout, and often performs in person the duties of Imam in the larger mosque, for want of a more appropriate personage in this town, where few sacrifice to Minerva. The smaller "Mesjid" [mosque] is destined for the use of his eldest son and heir Kasim [Jassim bin Muhammed Al Thani, 1826—1913], a more dashing character than his father, but equally close-fisted. His castle or residence, a white square building with little battlements and pointed windows, almost like imitation Gothic, stands near the southern extremity of Bedaa'; beyond it low rocks shut in the bay. We were soon tired of drinking bad coffee, for the berry of Yemen here gives place to the inferior produce of India, unpalatable stuff to those accustomed to real Mokha [Mocha]; tired too of hearing or spinning long yarns in Ebn-Thanee's divan, and of snuffing up the bad air of a dirty coast and muddy beach. So we resolved to diversify our Katar existence by a few trips to the localities around. My first visit was to Dowhah [Doha], a village to the north of Bedaa', and of about half its size; it is situated, as its name of "inlet " or "creek" imports, in a small deep bay, where the cliffs behind, sixty or eighty feet high, give it a somewhat picturesque appearance. But the houses of Dowhah are even lower and meaner than at Bedaa', and the market-place is narrower and dirtier. Two castles overtop the place: one stands on the neighbouring cliff, the other within the town itself; the chief is a small sub-collector to Ebn-Thanee. Hither, three days before my departure from Katar, arrived the wife-hunting governor of Bahreyn in pacific quest of a temporary Helen, as above described. My next excursion was to Wokrah [Al Wakrah], a town equalling Bedaa' in extent, but situated higher up on the shore, and of a more cheerful character. Its young chief, also a Mohammed by name, but not of the Ebn-Thanee family, proved intelligent and polite, besides being much more hospitable than his namesake at Bedaa'. In government and police Wokrah is independent of any other town. Under the patronage of its chief, several small traders and artisans from Bahreyn have established themselves here; and Wokrah has on the whole a thriving look. The road leading to it from Bedaa' is bleak and barren, close along the coast; the distance is within ten miles. I made the journey on a hired donkey, these animals being the ordinary conveyance in Katar for short distances; my beast was equipped with a sidesaddle, which made me look if not like a gentleman, at least in one respect like a lady, while my long Arab shirt might represent a riding-habit. Nor did I take with me any companion, so secure are the coast-roads, and so many the comers and goers in this land where business supersedes or suspends mischief. But my associate Ebn-Khamees, more in search of profit than of pleasure, imagined that a few packages of dates might be acceptable to Kasim, the old chief's son, and would needs try his luck with that nobleman, in spite of all I could say to the contrary. Kasim was at the time absent from Bedaa' on a hawking-party some twelve or fourteen miles off to the southwest. We procured dromedaries, mounted, and rode on our way, over desert uplands and pebbly tracts. We passed bands of women in quest of water from the distant wells; and flocks of sheep, or rather of goats, for the breed is of ambiguous appearance, well guarded by numerous shepherds; occasionally we met some traveller with his lance over his shoulder against the perils of a Bedouin frontier. No trees, little herbage, and a cold keen wind from the north. At last we reached the desired spot, a tolerably grassy valley amid undulations and hillocks on the marge of the "waste and howling wilderness." Here in tents, bivouac guise, was the young chief with his retainers, on the look-out for partridges and quails, of which he had hitherto caught few; with an eye too on hares, or I had better said on those equivocal animals, half hare, half rabbit, which abound on the Arab mainland. Kasim had with him about twenty horsemen, falconers, and half a dozen lovely hawks, besides two brace of greyhounds ("Selakee" they call them here); a thorough hunting-party, except that there was not a single fowling-piece among them. We remained half a day in his highness's society, and enjoyed a sort of Arab pic-nic, enlivened by hawking. For a minute description of this sport in the East, I may refer my readers to that well-known and accurate work, Layard's [Sir Austen Henry Layard, 1817–1894] "Nineveh..."
Yoosef-ebn-Khamees delivered his presents and received fair words, but little else. Kasim appeared to me even less amiable than his father; narrow-minded and less well informed than the old man, while at the same time he was more pretentious and haughty. He affects the Nejdean in dress and manner, but has far more devotion at heart for the diva pecunia than for the precepts of the Coran [Qur'an, Koran]. His men, like those of Justice Shallow [from Shakespeare's The Merry Wives of Windsor], had a "semblable coherence with their master's spirits," which rendered their society dry and unprofitable. Next morning we took leave of Kasim, and returned by the way we came, to eat fish and drink bad coffee with Ebn-Thanee. We waited yet a couple of days, hoping for a favourable wind to convey us straight across the Gulf to 'Oman. The land journey by the coast would have required at least a fortnight, perhaps more; and the reports current in Katar touching the rapacity of the Benoo-Yass, their treachery and other ill qualities, did not encourage us to try their hospitality, especially with Yoosef's presents and retributions in our keeping. Besides, all affirmed the road to be even more desolate and monotonous than that of Katar itself, and that it could offer nothing to repay our labour in traversing it. The sands of the Dahna reach the very margin of the sea; a glance at the map will enable my reader to understand this district. Accordingly we proposed following the diameter of the semicircle over-sea, in preference to its sandy circumference, and thus make direct for Sharjah, the first considerable town situated within the territory of 'Oman proper. For this a worthy young sea-captain, native of Charak [Bandar Charak] on the opposite Persian coast, offered us his ship and services. But here again the future had for us more roundabouts in store than had entered into our original calculation. "The traveller can reckon his setting out, not his return," says a trite Arab proverb, true in some degree everywhere, but most so in the East. Our captain was soon ready for sailing, and his crew on board. We made our parting arrangements, and on February 6 , while a lovely evening promised a fair morrow, and a light west wind seemed to ensure us a good and speedy passage to Sharjah, we took our leave of Mohammed-ebn-Thanee, who had now become very intimate in his way, said adieu to three or four other friends acquired at Bedaa', and entrusted ourselves to a little boat, wherein Faris, to give our captain his proper name, with his younger brother Ahmed and two of the crew, had come to fetch us off to the ship. We now crossed by rowing the same space that I had footed over the sand some days before; but then it had been ebb, whereas now the full tide was running in ten or twelve feet deep. The flux and reflux of the waters is here only once in twenty-three hours, that is, at every alternate period; at Bahreyn and on the coasts of Persia and 'Oman it is once in eleven. The peculiar position of Katar and of the Benoo-Yass region at the bottom of a deep gulf, will explain this meteorological phenomenon to my scientific readers; the Arabs content themselves with noticing and wondering at it.